The Bodyguard will return to theaters for one night only! Later this month, fans can relive a highlight of Whitney Houston’s musical and acting career on the big screen, where the film first made history back in 1992. An honorable funeral, a Grammy Awards performance, a pending biopic film, an upcoming tribute episode on Glee and an exclusive interview with the survived family on Oprah’s Next Chapter — these are all the ways in which different parts of Hollywood have chosen to celebrate the life of the late Whitney Houston. Add to that the efforts of Warner Bros. and NCM Fathom, who have teamed up to present fans of the late singer with a unique evening nationwide — The Bodyguard will be re-released in theaters for one night only, on March 28! According to The Hollywood Reporter, the re-release coincides with the romantic thriller’s 20th anniversary. The Bodyguard — starring Houston as a famous singer and Kevin Costner as a former Secret Service agent hired to protect her — was the second-highest grossing film worldwide in 1992. Even more so, the soundtrack became the best-selling soundtrack of all time, selling more than 42 million copies worldwide. “I Have Nothing” and “Run to You,” were nominated for Oscars, while “I Will Always Love You,” “I’m Every Woman” and “Queen of the Night” became some of Whitney’s most memorable musical moments. 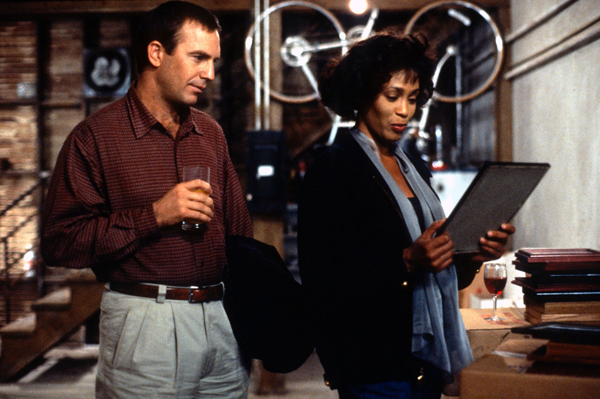 At her funeral, Kevin Costner took to the podium and reflected on his time working alongside Houston in The Bodyguard. Mark your calendars for March 28! The Bodyguard will screen at 400 select theaters nationwide at 7:30 p.m. local time.